1 1. In 4-quart saucepot, cover potatoes with water; bring to a boil over high heat. Reduce heat and cook potatoes about 8 minutes or until tender, adding green beans during the last 3 minutes of cooking. Drain and rinse with cold water until completely cool. 2. In large bowl, combine Hellmann's® or Best Foods® Real Mayonnaise, green onions, dill, salt and pepper. 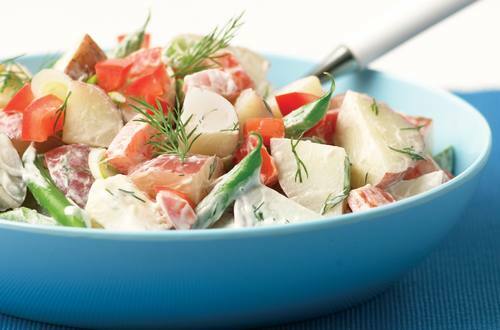 Stir in potatoes, green beans and tomatoes. Serve chilled or at room temperature.